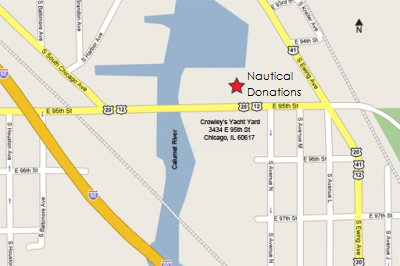 Where to Donate | Nautical Donations, Inc.
All donations, whether equipment or boats, need to be made in person at our location at 3434 E. 95th St. (on the north side of Crowley’s Yacht Yard). If you’d like to make a donation, please contact us FIRST to make arrangements for your drop off. Email us at info@nauticaldonations.org or give us a call at 773.672.2080. Don’t forget to complete one of our donation forms. Our office is located on the north lot of Crowley’s Yacht Yard at 3434 E 95th St, Chicago, IL 60617. Just click on the map for directions or search for “Nautical Donations” on google maps.